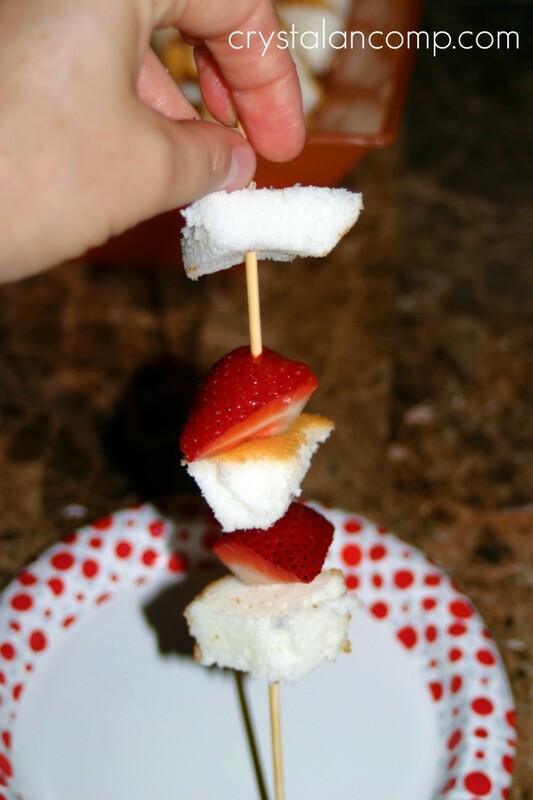 One of my first recipes to take off on Pinterest, way back in 2011, were these Strawberry Shortcake Kabobs. I clearly remember getting traffic to my blog from this site called Pinterest…. we did not even know for sure how to pronounce it. Now, this recipe has been duplicated over and over and over again on Pinterest. Kind of cracks me up a little. Such a simple recipe has become a hit that many people love. 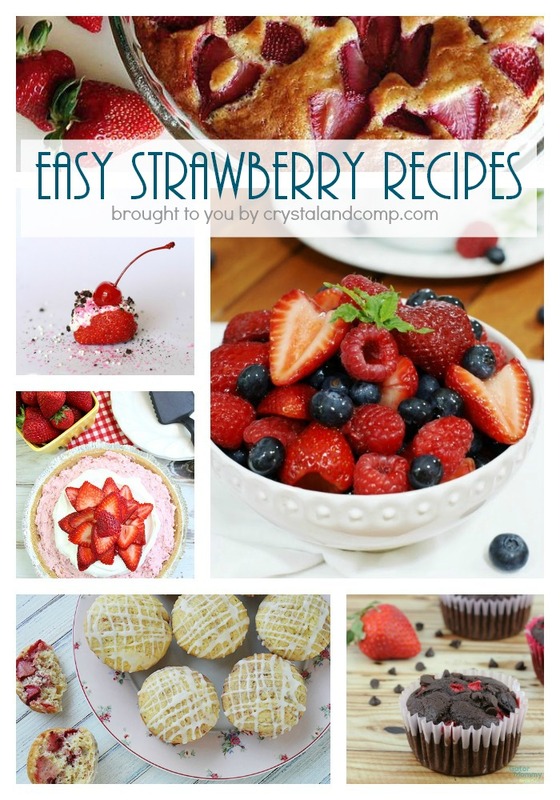 I get it though, they are super easy to make and who does not love strawberries? 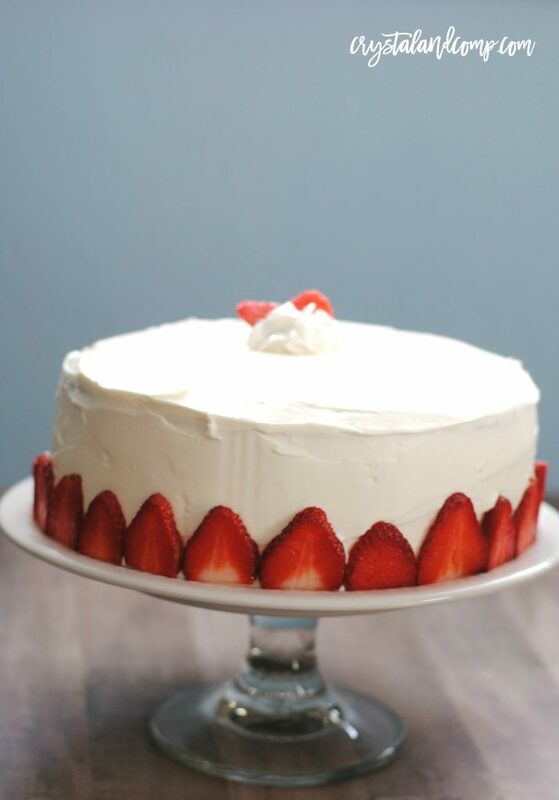 We waited with baited breath for strawberry season to begin. It’s the perfect summer fruit, addition to cereal, snack, side, you name it. You will adore how easy these are to make, but also perfect for a camping trip, baby shower, birthday party, or just because. No forks? No problem. Eat these right off the stick! 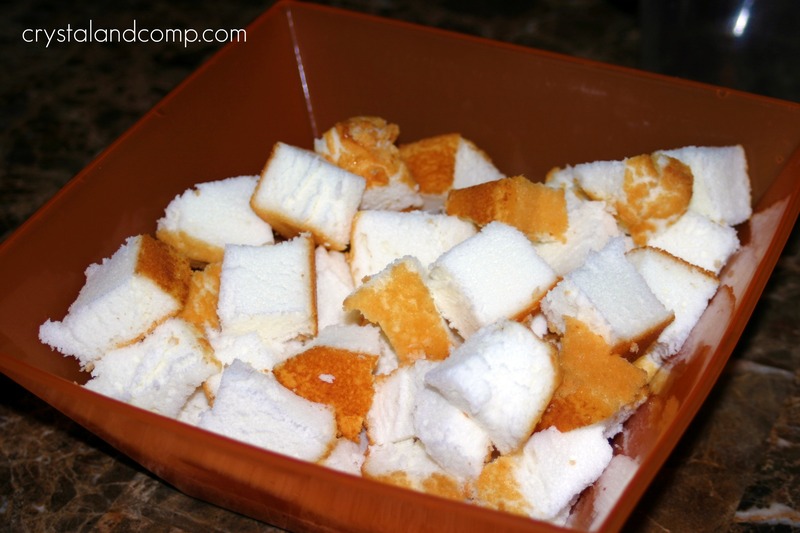 Cube your angel food cake. It does not have to be perfect cubes as your cake is likely round so some pieces will be odd shaped. Look at these fresh strawberries from Russia. My friend who is a missionary in Russia also makes my recipe videos. She searched high and low to find the perfect batch. 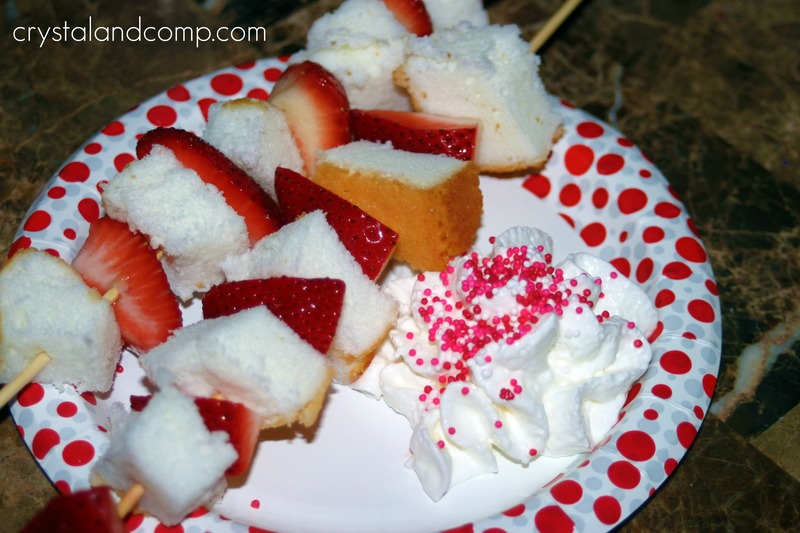 Grab your skewer and alternate with angel food cake and strawberries until the skewer is as full as you want it. This is a fun step the kids can help with. You can have them build their own kabob if you like. Here is an old picture from 2011 when we made these and how we assembled them. Once we’re done I like use kitchen sheers to cut the sharp end off of the skewer for safety reasons. The kids love this step as well…. the whipped cream! Especially the canned kind. 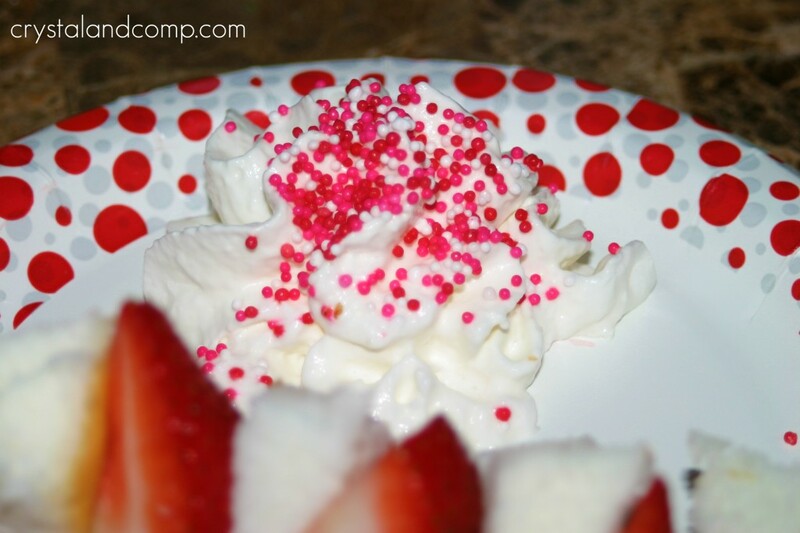 Make a nice heaping of your favorite whipped topping on the individual plates you will serve the kabobs on. 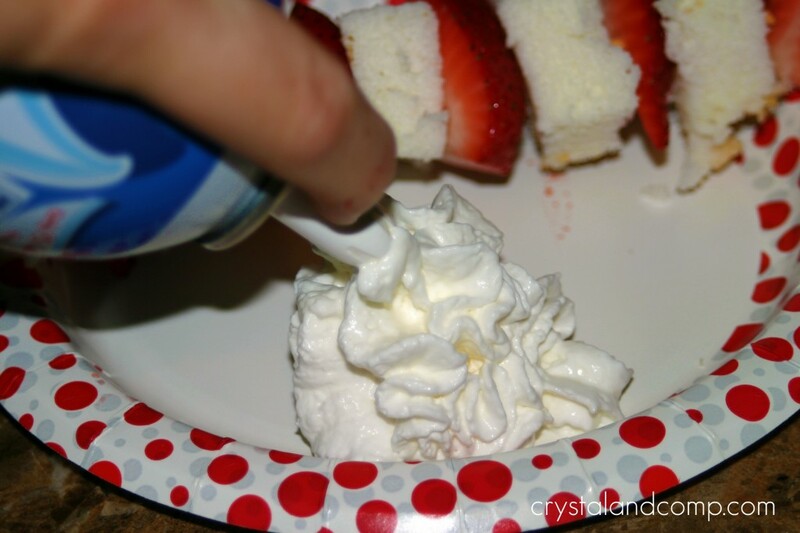 Or, you can make your own homemade whipped cream using the strawberries. We show you in the video below how to do this. And what makes whipped cream more fun than your favorite sprinkles? Coordinate the colors to match the theme of your celebration. Red, white and blue sprinkles would rock for your 4th of July party! 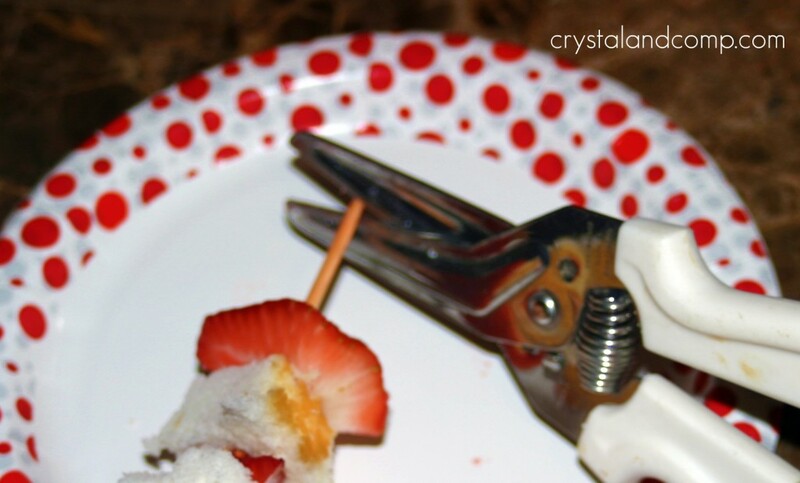 If you’re letting kids make their own kabobs, this is an super fun step! Here is what they looked like in 2011 when we made them. Here is what they looked like when we made them a little fancier with the strawberry whipped cream and opted for no sprinkles. A little more grown-up if you will. Here is our original version that went viral on Pinterest way back in 2011. I remember being at a conference here in the DFW area listening to someone talk about this new platform Pinterest and how it was bringing bloggers tons of traffic. I chimed in and said I have two recipes going crazy because of that site…. 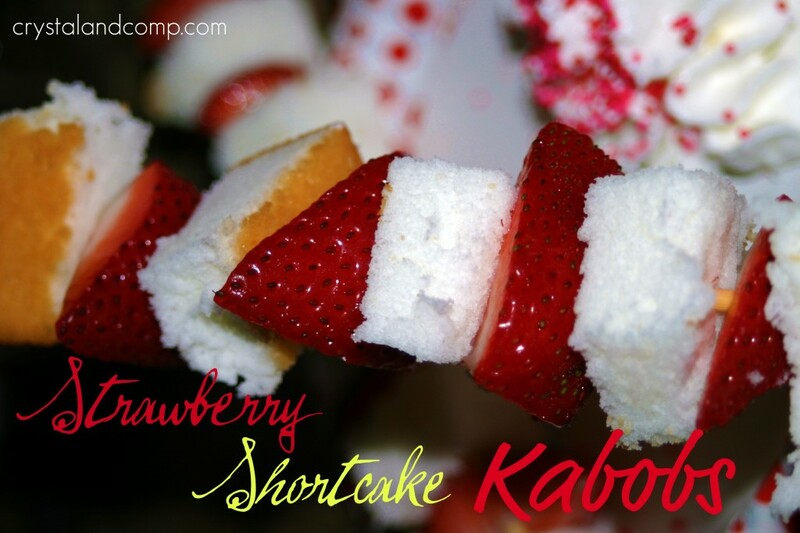 one recipe were these strawberry shortcake kabobs and the other was my crockpot ravioli. Another recipe that has been duplicated on Pinterest over and over again. The blogger I was chatting with, is now a Facebook building guru and she instantly said she knew exactly which strawberry recipe I was talking about. At that time simple images did great on Pinterest. 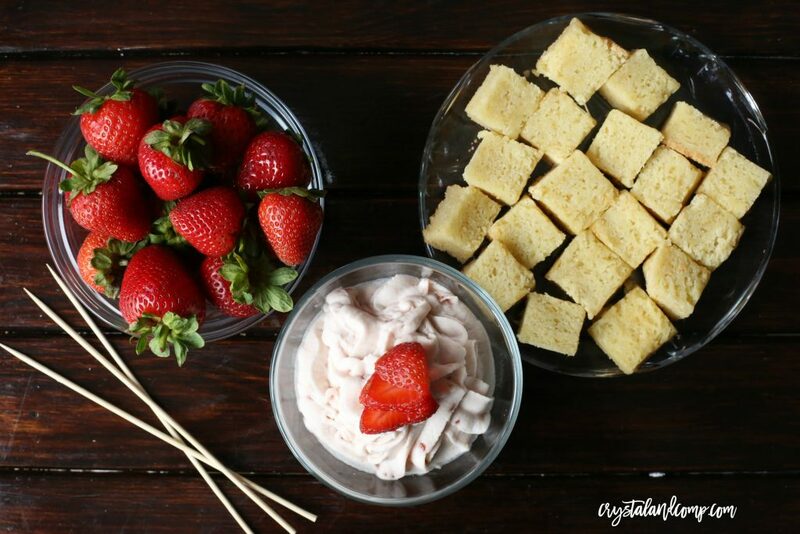 Here is the video where we show you step-by-step how we make these strawberry shortcake kabobs and the homemade whipped cream! Oh, and after months of Tweeting your posts and commenting on them, I decided I should follow your blog. Haha! Go figure! You’re so funny! Thank you for all you do! omg that looks delicious! going to have to try that! Glad you like. Thanks for reading Pamela! Great idea! My kids would love this. And I would love an excuse to make another angel food cake. Yum. Katie, it was very simple and my kids had fun. Best of luck! Besides looking delicious they are stinking cute for summer. I’m totally going to make some. Thank you for sharing! These look so good! I will definately be trying this out! Awesome idea Danielle! Have fun with it! This is a great idea. So easy and delicious! I guess it makes them more appealing. Donna- you really can do so much for kabobs to make food fun. Esp for kids! Oh my goodness! Another super cute, EASY and PRETTY recipe! LOVE this one! Totally great for parties! 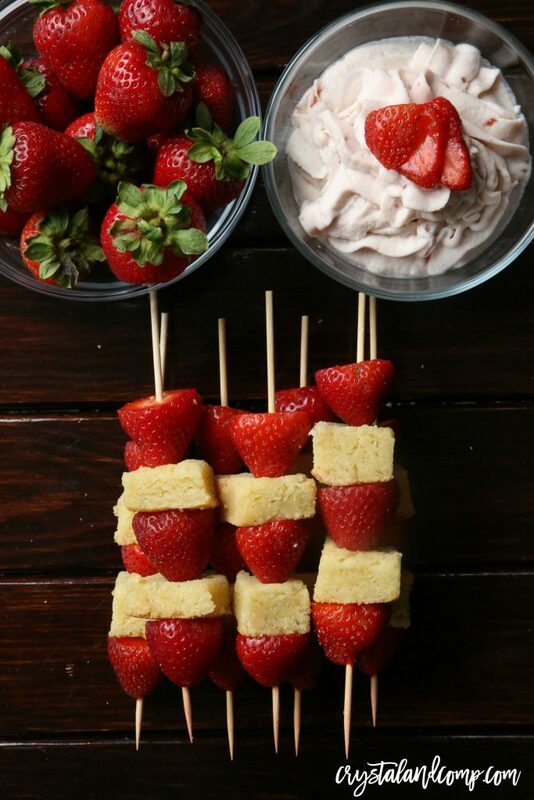 How yummy and festive for the 4th do these look?! YUM! Yum!! These look great! Great thing to bring for potluck!! How perfect for summer parties!!! Would love for you to stop by and share at my Calling All Crafters link party! yummy, what a cute and delicious idea! Wow! This is so creative! First i’m pinning it…then i’m making it!! Thanks for sharing!! Those look really yummy. I’m picturing them drizzled with a bit of melted chocolate. Yum! love this! It is so simple yet so fun. I wish I had seen this before I wrote my post because I would have definitely added it to the list. Are these not just the coolest treats!? Yum! 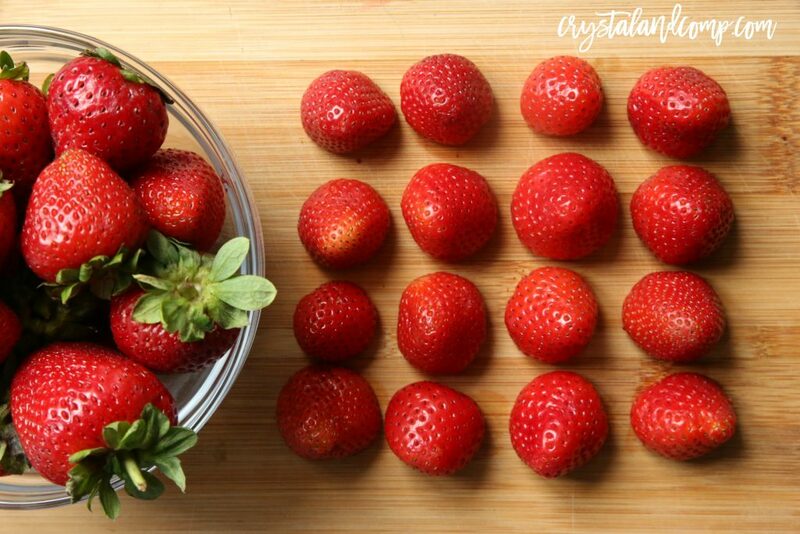 You read my mind b/c I’ve been thinking about strawberries all morning! This looks amazing! yummy! looks so festive, too! of course, I would be tempted to dip these in chocolate! I made these this past thursday night for a small family “4th” get together and i added blueberries for the red, white and blue touch. Everyone loved them! they were so simple to fix and i didnt mind the kids “stealing” my berries as i made them. Thank you so much for linking this up to tip junkie, which is where i saw it. I never thought to put cake with the fruit on the kebab sticks! Great idea!! You have been “featured” today… thanks for sharing a wonderful recipe! Stop on over and pick up a button if you’d like! OH. MY! I am really trying to resist licking the computer screen. These treats are just too yummy looking! Thanks for sharing. If you will excuse me, I have some strawberries in the fridge that are calling to me! That looks like a yummy way to eat strawberry. What a great idea and a fun dessert, it looks delicious. I have joined your site. Thank you so much for sharing with Full Plate Thursday and sure hope to see you again real soon! Theses are so cute and so easy! My daughter is having a strawberry shortcake Birthday party this year and I think that these just might make the buffet! Thanks for the great idea! yummmmmm. I want some now! super simple and looks great! would be nice with some chocolate syrup too, or a chocolate fondue if you really want to impress! thanks for sharing on Craft Schooling sunday, hope we’ll see you again soon! Love the idea.. simple and easy, yet attractive. I’m following from Welcome Wednesday. Hope you’ll follow back. Oh my goodness, my kids would love this! And, I can totally do this! 😉 (I’m not the best cook…) Thank you so much for sharing this fun idea! Love this. Never would have thought to add the sprinkles. My grandchildren will love this. These are great! I think I’d add some blueberries for Memorial Day or 4th of July. Martha- what a great idea! Love this idea! It might work really well for a party we’re doing! Yummy! 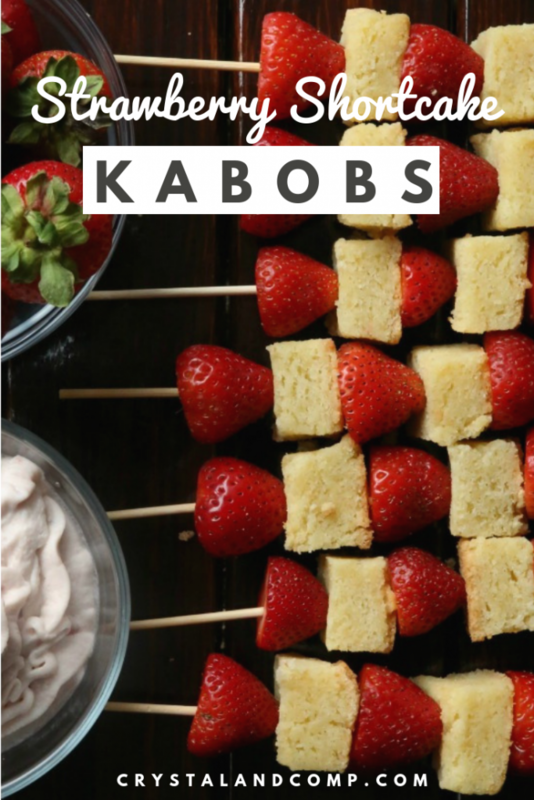 The grandkids think any type of kabob recipe is so much fun to help make or eat! Thanks for stopping by, Cindi. I love this! I’m always looking for something a little different. Thank you for sharing it. Awesome, Barb. Glad you like them. They are easy to make and super fun. Hey Crystal! You are so creative. We have lots of guests coming this summer and I really get tired of heating up the house every afternoon to make a dessert. The sprinkles add a playful touch. Brilliant! 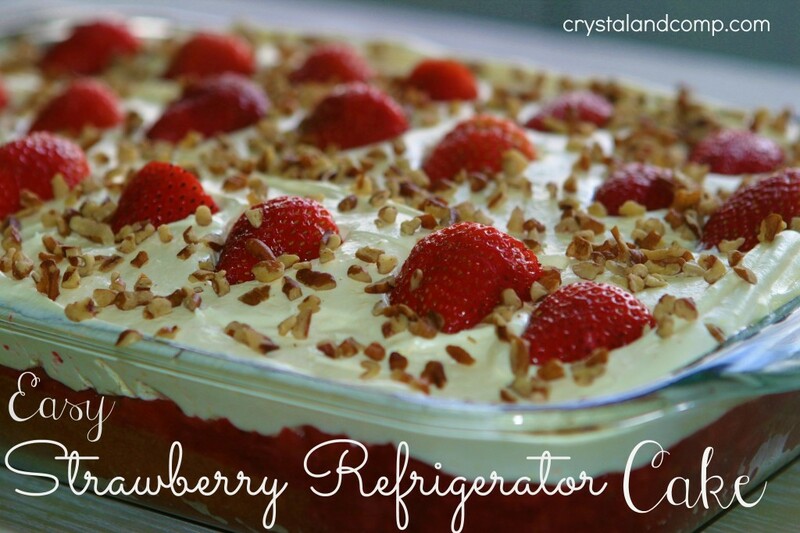 This is a wonderful treat and just in time for the upcoming holiday entertaining! Hope you have a very special week end and thank you so much for sharing with Full Plate Thursday. I love this!!! 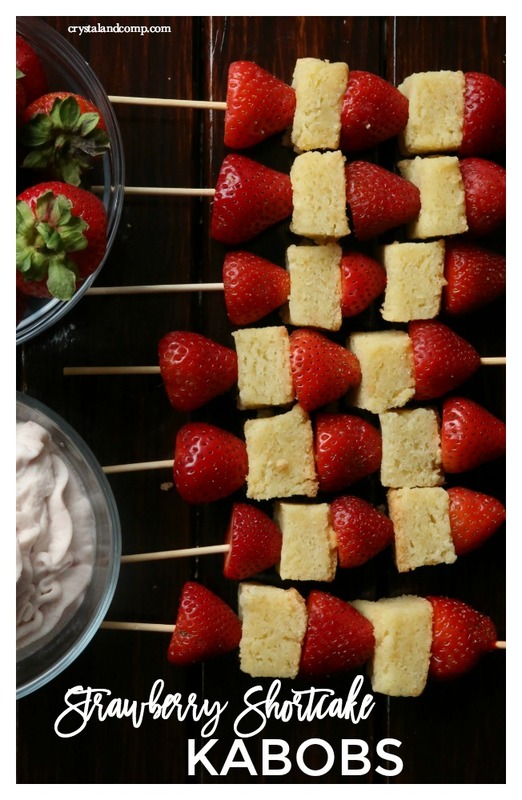 What a great idea to make kabobs out of the ingredients, this would be so fun for a party!!! Thanks for sharing this and for the inspiration! What a super fun and easy idea! OH MY…. How divine! I love the twist of it being on a stick. My kids love any food on a stick :o) Just wanted to let you know that you will be featured at tomorrows Tasty Tuesday party! PS I would love to see the party linked up on your posts! What a fun spin on a traditional treat-looks yummy! I’ve made these for brunches with donut holes instead of the shortcake and drizzled them with chocolate. Yummy! !